located in the Kantō region on the main island of Honshu.
. Ibaraki - Entries of this BLOG .
. Madara Kishin Sai マダラ鬼神祭 Madara Demon God Festival . Kashima Daijin (鹿島大神) "Great God at Kashima". a patron of the martial arts. In the precincts ther is a famous training hall (doojoo) for martial arts, especially sword fighting (kendoo　剣道). Thank you, Rob, for sharing your photos! Rob lived in Kashima for quite a while in 2002. 36 people walk around the villages and shout the outcome of the divination at the shrine Kashima (鹿島神宮), which occured on January 4. If you see a white horse during the New Year celebrations, you will live a long life and ward off evil for the coming year and stay healthy. Therefore shrines with a white horse make a parade for all to see the animal. 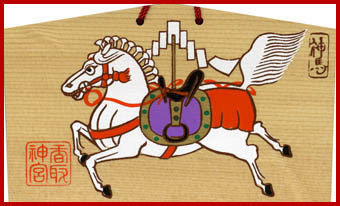 In Kashima, they parade seven white horses. If you pick up a small stone where the horses walked or have your hankerchief trodden on, this will bring your love to fulfillment. On this day, white sweet ricewine (amazake) and porridge of seven herbs is also served. 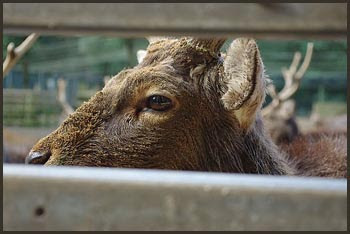 The Saito Sai dates back more than 1200 years to the Nara Period (710 to 794). Soldiers called sakimori 防人 were sent off to do duty in far-away Kyushu. Before leaving, they gathered at Kashima Jingu to offer prayers for victory in battle and a safe journey. Many people paraded through the streets to see them off and wish them well. Lately this has become a wild parade through the city. Now the festival is held to pray for a good harvest of the five crops, rice, wheat, beans, foxtail millet and egg millet. Officials in traditional garb with sashes to hold back the long sleeves in the five colors representing these crops parade through the street. 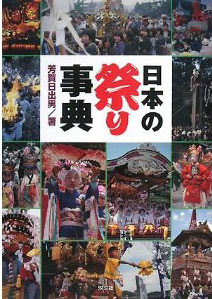 Others with long poles jump around a drummer, dance and sing the special festival song "Soranbushi ソーラン節". There are many wild groups of this kind, all in different colored robes. The term SAKIMORI first appeared in 645, and it is interesting to look at its etymology. Though the Japanese characters used to write it are now 防人, which is a compound difficult even for Japanese to read and literally means DEFENDING PEOPLE, the origin of the word as it PRONOUNCED comes from the characters 崎守 SAKI MORI, which means defenders of the capes, the fringes of the country, or 境守, SAKAIMORI, literally border protecters. Another way of writing the word sakimori 先守, sheds further light on the intended purpose of this conscripted force as it means the pre- defenders, or the first line of defense, which is in fact what they would have been in case of an invasion. Their role would be to hold off the enemy long enough for a large army made up of soldiers from Western Japan to show up.
. . . 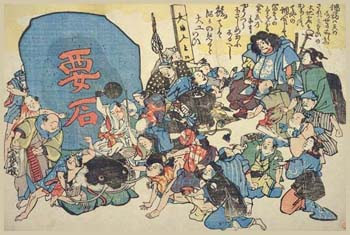 The Sakimori system, which actually remained in operation for a period of 163 years ( until 826), imposed great hardships on the conscripted men and on their families ( which was why the system was eventually abolished, along with the fact that the fear of invasion also eventually faded away). made their way into the Manyoshu. is a special word (makurakotoba) to denote the God of Kashima in the Manyoshu poetry. On the 10th day of the first lunar month. It is customary for a young girl to present a girdle to the Gods of Kashima and wish for a good partner in life. They would write the name of their future husband on the belt and hope for the Deities to tie the knot for them. This dates back to Emperess Jingu Kogo and her belt during pregnancy. It is possible to think of Kashima faith as the sect based at Kashima Jingū in Kashima-machi, Ibaraki Prefecture, but it can broadly be divided into beliefs related to water, "tutelary of roads" (sae no kami 障の神（さえのかみ）), and Kashima shrines. Many regions and shrines bear the name "Kashima," and since these are usually found in river, stream, lake, or swamp areas, we can assume that the origins of Kashima faith are profoundly connected with water. Images of sae no kami are called Kashima dolls, straw dolls, Shōkisama, and dōsojin, among other names. Most of these images are very large, made of straw, and are characterized by their exposed sexual organs. They protected village borders from the invasion of "plague kami" (ekishin) and were prayed to in order to ensure safety or prosperity. In some regions, during the Kashima Festival dolls are placed in "Kashima boats" and sent out to sea in order to send ekishin away. According to the Hitachi no kuni fudoki, the "enshrined kami" (saijin) at Kashima Jingū in Kashimamachi, Ibaraki Prefecture is "Kashimanoama no ōkami," but there are many documents, including the Kojiki, which record the saijin as Takemikadsuchi no kami. The latter is worshipped at the first shrine within Kasuga Taisha, and was exalted to a "kami of the nation" (kokkashin) when the imperial court expanded into the Tōgoku region. In the Heian Period, the Jinmyōchō section of the Engishiki records that "spirit emanations" (bunrei) of the Kashima kami and "honorable child kami" (mikogami) were enshrined in Mutsu no kuni, indicating that the cult may have spread in connection with the government’s expansion into the Tōhoku area. Even into the early modern period, the distribution of Kashima emblems (shinsatsu) by itinerant Kashima priests called kotobure was a means of spreading the Kashima cult among the common people. The popularity of the "three-shrine pilgrimage" that included Katori, Kashima and Ikisu was the result of the development of inland waterway transport on the Tonegawa and other rivers, and is also related to the growing economic status of the Edo populace. The ritual of "hitachiobi 常陸帯 " on January 14 at Kashima Shrine became widely known, being mentioned in The Tale of Genji and in a yōkyoku (Noh script). From the medieval period, the virtues of Kashima were "preached" (shōdō ) by traveling monks. This can be inferred by the inclusion of the chapters "Kashima Daimyōjin" and "Kasuga Daimyōjin no koto" in the Shintoshū. 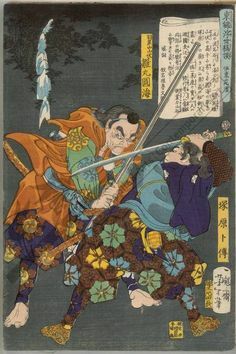 The Hachimangū dōkun (also read dōkin) and various Hachiman "origin legends" (engi) include a story where the Kashima kami is equated with Azumi no isora and a legend about Shioyaki Bunta. 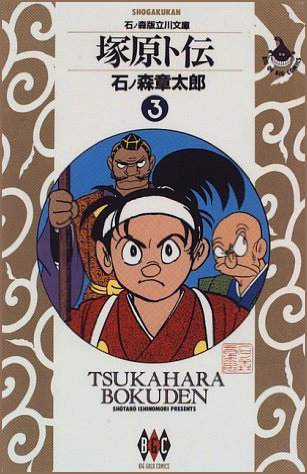 Shioyaki Bunta is also the protagonist of the otogi-zōshi tale "Bunshō sōshi," but the Hachiman legend comes from a separate tradition. These stories spread through the preaching of low-ranking religious leaders and Zenkōji hijiri. The "Kashima odori" performed in the western area of Sagami Bay involved dancing while dressed up as Kashima no kotobure, who would travel around distributing takusen of good or bad fortune and amulets. The dance may have originated at Kashima Shrine. There is also a legend about a "keystone" (kaname ishi) within the shrine precincts that the kami of Kashima uses to restrain a tremendous fish under the earth, whose movement causes earthquakes. Thus, Kashima is also famous for its cult of warding off earthquakes. source : Nogami Takahiro / Kokugakuin University. The Kensen Ritual is performed on September 9 to 10 every year at Kashima Shrine in the Yonekura area in Osaki City, the rice producing center of Miyagi Prefecture, where famous rice brands such as Sasanishiki and Hitomebore were born. Kensen is a Shinto ritual of offering food to the god. It is performed before a shrine priest offers a prayer. As the oldest and most historic shrine in Osaki City, this ritual had been performed by the descendants of the vassals of the Osaki clan (a branch of the Ashikaga clan, who were descended from Seiwa Genji) until the end of World War II. Today it is performed by the hands of local people. On the first day, the first rice ear of the season is offered to the god in appreciation for a rich harvest. Then, it is followed by other rites and ends with Naorai (banquet), in which holy sake wine and votive offerings are served to the participants. The finale of the festival is the parade of Mikoshi performed on the second day. This solemn ritual is prefecturally designated as an intangible folk cultural property (manners and customs). was located in Shiroyama, Kashima City, Ibaraki Pref. It was built by Kashima Masamiki in the Kamakura period (1192-1333). The Kashima clan was appointed as Sodaigyoji-shoku (general director of rituals) in 1368. Since then the family was called by this title and gained prosperity. a type of 神明鳥居 Shinmei torii, a rather simple form without an incline or secondary lintel. The topmost lintel is round and longer than the two pillars. Another sample is at Katori Jinguu 香取神宮.
. amulet against sainan 災難除守 misfortune and disaster . One very famous historical Anzan Talisman in the shape of a crystal pearl was used by Fujiwara no Ishii 藤原威子 and then donated in 1034 to Kashima Shrine, later it was also used by Emperess Jingu Kogo 神功皇后 Jinguu Koogoo. His father was a retainer of the Tokugawa Government and his mother was the daughter of a Shinto priest from Kashima Shrine. a famous swordsman of the early Sengoku period. He was widely regarded as a kensei (sword saint). He was the founder of a new Kashima style of fencing, and served as an instructor of Shogun Ashikaga Yoshiteru and Ise provincial governor Tomonori Kitabatake. ... 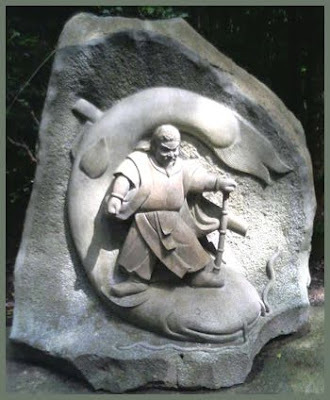 He later systematized the teaching of the Kashima area's local martial arts, including such approaches to combat as Kashima no tachi and Ichi no tachi. After allegedly receiving a divine inspiration from Takemikazuchi no kami, the deity of Kashima Shrine, he named his martial system as Kashima Shintō-ryū. He also, for a brief period, called his system Mutekatsu-ryū ("winning without hands"). He died of natural causes in 1571. His grave, in Suka, Japan where Baikouji once stood, is a kind of pilgrimage site for those devoted to Japanese sword-fighting arts (kenjutsu).
. . . CLICK here for Photos : Tsukahara Kotaro 塚原小太郎 ! the martial arts master Tsukahara Bokuden receives divine instruction in the art of fencing from a mysterious yamabushi (mountain priest) tengu named Enkai of Haguro Mountain.
. Haguro San 羽黒山 . 羽黒出羽三山 Three mountains of Dewa . He started off by boat from Basho-an on the 14th day of the 8th lunar month to see the full moon. He visited temple Kashima Konpon-Ji 鹿島根本寺 and stayed with the priest Butchoo 仏頂和尚 Butcho (1643– 1715). Basho practised Zen with Master Butcho. He came back home on the 25th. The impact of Zen Buddhism on Basho's haikai is a popular theme for Western writers. 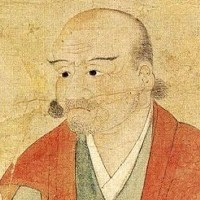 Basho's encounter with his Zen teacher, Butcho is estimated to have taken place around 1681 (Tenwa 1) a year after Basho moved to Fukagawa. (On the withered branch/ A crow has alighted-/ Nightfall in Autumn. Tr DK). furuike ya kawazu tobikomu mizu no oto.
. WKD : Karumi and Zen - Susumu Takiguchi .
. Travelling with Matsuo Basho 松尾芭蕉 .
. Zen Master Butchoo, Butchō 仏頂和尚 Butcho and Temple Ungan-Ji . 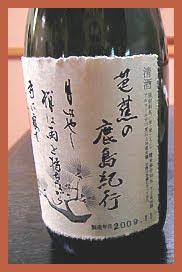 Even a sake ricewine is named after Basho ! Cheers !
. A visit to Mount Tsukuba　筑波山 . Written at temple 根本寺 Konpon-Ji.